If you have version 1.0 of the mxODBC Connect Server running on a machine, please stop the server prior to upgrading. Not doing so can lead to error messages during the installation of version 2.0, e.g. due to timing and lock issues. The version 2.0 installer will try to shutdown the 1.0 installation prior to continuing with the installation, but since this is done asynchronously by Windows, it is possible that the 1.0 server hasn't completely shut down in time for the version 2.0 installer to proceed with the installation. 3. proceed with the version 2.0 mxODBC Connect Server installation. When upgrading from 1.0 to 2.0, you can leave the configuration files in place. Version 2.0 of the server still knows about the 1.0 configuration settings and will apply them in the same way. Unlike version 1.0, version 2.0 is now using a single port to implement SSL and plain-text communication. As a result, the configuration setting using_ssl was replaced with require_ssl and allow_ssl. This offers more flexibility in the setup. You can still use a two port configuration, if you like, but the default port no longer switches from 6632 to 6633 in case you enable SSL in the connection section. mxODBC Connect Server 2.0 uses SHA1 digest values instead of MD5 digest values. This change will increase security of the client certificate checks. Affected are the server configuration options client_certificate_digest and client_certificate_digest_file. Both now require SHA1 HEX digests instead of MD5 HEX digests as was needed for mxODBC Connect Server 1.0. For the version 2.0 of the server, we have registered the port 6632 used by mxODBC Connect with IANA (as mxodbc-connect service). Since assigned ports are a rare resource, port 6633 is no longer used by the server per default. However, you can still configure the server to use this port, if needed. Port 6632 can now be used for both SSL and plain-text communication. It is even possible to have a mixed setup where some clients use plain-text and others use SSL communication over that port. mxODBC Connect Server uses the new mxODBC 3.2 version on the server side, which provide better compatibility with current ODBC drivers and also include a number of new features compared to the older mxODBC 3.0 version included in mxODBC Connect Server 1.0. Please see the mxODBC User Manual and Reference Guide for details on the mxODBC ODBC driver support enhancements. ● On 64-bit Windows systems, please make sure that you are configuring the right ODBC manager variant for the version of mxODBC Connect you have installed. Windows provides the ODBC manager as 32-bit version and 64-bit version, each with a separate list of data sources. If you install the 64-bit version of mxODBC Connect, the default ODBC manager from the C:\Windows\System32\ directory should be used. If you are using the 32-bit version of mxODBC Connect on Windows x64, please use the 32-bit version instead. You can usually find it in the C:\Windows\SysWOW64\ directory. After installation of the mxODBC Connect Server, you will find an entry "Start the ODBC Manager" in its start menu which will point to the right manager for your installation. ● You may need administrator privileges on Windows XP/2003 and later to successfully complete the installation or un-installation process. Please run the installer/uninstaller as administrator on Windows XP/2003 and later. Please uninstall any existing version of mxODBC Connect Server, if you have a previous version installed (see section 2.2.3 for details). egenix-mxodbc-connect-server distribution, double-click on the executable to start the installation process. Depending on your OS version, you may need to click through a user account control (UAC) security dialog to proceed. Then follow the instructions of the installer. During the installation process, the installer will create example server and client SSL certificates that you can use to setup the server to accept SSL encrypted connections. See section 2.4mxODBC Connect Server Configuration for more details. The installer will also ask you for the mxodbc_connect_server_license.py file that you should have obtained from eGenix.com by email when signing up for an evaluation or after purchase of an mxODBC Connect Server license. If you haven't yet downloaded and unzipped the license archive that was attached to the eGenix email, please do so now and point the installer to the location where you extracted the mxodbc_connect_server_license.py and mxodbc_connect_server_license.txt file for your installation. Note that the installer will just ask for the mxodbc_connect_server_license.py file and expect the mxodbc_connect_server_license.txt to be in the same directory. The installer registers a service named mxODBC-Connect-Server. This will listen on TCP port localhost:6632 by default, i.e. the server will only accept connections from the local machine on port 6632. TCP port 6632 is used for both plain and secure (SSL) connections. It's a IANA registered service port for eGenix mxODBC Connect with name mxodbc-connect. You may have to configure your firewall to allow connections on port 6632 if you want to permit connections from a local subnet. After installation, you must edit the configuration file of the mxODBC Connect Server to fit your needs, e.g. have it listen for connections from the local subnet, and then restart the service in order for the changes to take effect. See section 2.4mxODBC Connect Server Configuration for details on how this is done. The installer registers a daemon named mxodbc-connect-serve. This will listen on TCP port localhost:6632 by default, ie. the server will only accept connections from the local machine on port 6632. You may have to configure your firewall to allow connections on this port if you want to permit connections from a local subnet. The configuration file uses a standard INI-file format (see section 2.4.1 on page 19) and has the following sections and options with their default values (some are OS dependant). Default port number is 6632 (IANA name mxodbc-connect) which is used for both plain and secure (SSL) connections and is a IANA registered port for eGenix mxODBC Connect. Setting allow_ssl to a non-zero value enables the secure socket layer (SSL) support on this connection. Note that the server can handle both plain text and SSL connections on the same port, if allow_ssl is set to a non-zero value. If you want to disable plain text connections, set require_ssl to a non-zero value instead. Default is to only accept plain text connections (allow_ssl = 0). Setting require_ssl to a non-zero value disables plain text connections on this connection. The client has to start a SSL connection if it wants to communicate with the server. If the require_ssl setting is enabled, allow_ssl is enabled implicitly, i.e. set to a true value. Default is to accept both plain text and SSL encrypted connections, if allow_ssl is enabled. Space separated list of SHA1 digest values of accepted client certificates. Name of a file that contains SHA1 certificate digests for client certificate verification. If none of the verification options are defined then all clients are accepted, regardless the content of their client certificates. The server log file lists the SHA1 digest values of all accepted certificates on each server start. It also logs the SHA1 digests of all client certificates it accepts, if one of the verification options is enabled. In order to accept connections from the network, you will have to customize the server configuration to your needs. This section explains how connections are setup. The mxODBC Connect Server supports listening on multiple ports and interfaces. Each connection configuration needs to be placed into its own section of the configuration file. The server detects the connection sections by looking at the section title. All sections that start with "Connection" are interpreted as connection configuration sections. This connection will not accept SSL-encrypted connections and also reject any connections from other subnets. The server installation will create two certificate files for you: server.pkey (the private key file) and server.cert (the public key certificate file). You can use these generated files as initial setup and later on replace them with your own public key certificate files, if you wish. Note that using allow_ssl = 1 will not force clients to connect using SSL. Plain-text connections are still possible as well. Please see the next section on how to disable plain-text connections altogether. The above setup emulates the setup which was used by mxODBC Connect 1.0, where two ports were used for the communication, one for plain-text, the other for SSL connections. With mxODBC Connect 2.0 and later, this is no longer necessary, since the server can now switch between plain-text and SSL as necessary. The mxODBC Connect Server can perform certificate based authentication checks when a client connects to it via SSL. For this to work, the connection needs to be configured to require SSL, e.g. All options are read and processed at server startup time, so any change will only take affect after a server restart. With this option, the incoming client certificates are checked against a file which contains the allowed client certificates concatenated in PEM format. To enable this client certificate check, please add the client certificates to a file on the server and then add the path to this file to the configuration file, e.g. The path may be given relative to the server configuration file's directory. With this option, the incoming client certificates are checked against a directory listing the allowed client certificates in PEM file format. The files have to use the extension ".cert" to be included in the search. To enable this client certificate check, please add the client certificates to a directory on the server and then add the path to this directory to the configuration file, e.g. The directory may be given relative to the server configuration file's directory. With this option, the incoming client certificates are checked against a list of allowed SHA1 certificate digests. To enable this client certificate check, please add the SHA1 digests in hex format to the configuration file as space separated entry, e.g. You can use the backslash (" \") at the end of a line to split the setting across multiple lines. With this option, the incoming client certificates are also checked against a list of allowed SHA1 certificate digests. In this case, the digest values are read from a file. To enable this client certificate check, please add the SHA1 digests in hex format to a file and then add the path to this file to the configuration file, e.g. If you also want to benefit from encrypted connections between the mxODBC Connect Client and Server, then you additionally need the Python standard library module sslinstalled, which is available in Python 2.6 and later, or the eGenix.com pyOpenSSL Distribution (egenix-pyopenssl). Please visit http://www.egenix.com/products/python/pyOpenSSL/ to download the latest version of the eGenix.com pyOpenSSL Distribution. For the version 2.0 of the server, we have registered the port 6632 used by mxODBC Connect with IANA (as mxodbc-connectservice). Unlike version 1.0, version 2.0 is now using a single port to implement SSL and plain-text communication. As a result, the configuration setting using_sslno longer switches the default port from 6632 to 6633. Please see section 2.1Upgrading mxODBC Connect Server for details on how to update the server configuration, which allows avoiding such client side configuration changes. Please see the mxODBC User Manual and Reference Guide for details on the mxODBC API changes. mxODBC Connect Client supports all features of the mxODBC 3.2 API, with the exception of a few details that are outlined in section 6. Differences between mxODBC and mxODBC Connect. Note that unlike the mxODBC 3.2 stand-alone version, mxODBC Connect Client is compatible with gevent. See 5.3gevent Support for details. ● Python 2.5 or later installed. See http://www.python.org for details and download instructions. ● For SSL support (optional), you should either have eGenix's pyOpenSSL Distribution installed or use the Python standard lib module ssl. See http://www.egenix.com/products/python/pyOpenSSL/ for details for details and download instructions of eGenix's pyOpenSSL distribution. The client has been tested with the official Python 2.5, 2.6 and 2.7 installers. Python 2.4 and below are not supported. You may need administrative privileges on Windows XP/2003 and later to successfully complete the installation or un-installation process. Please uninstall any existing version of mxODBC Connect Client if you have one installed (see section 3.2.3 for details). Please uninstall any existing version of mxODBC Connect Client if you have one installed (see section 3.3.5 below for details). Hint: On some Linux distributions you may get an error when using the --homeoption. In such cases, please try using the --prefixoption instead. If that doesn't work in your case, you can also simply remove the ODBCConnect/subdirectory from your /…path to Python…/site-packages/mx/directory of your Python installation (the exact location depends on your Python installation). 2. edit the file easy-install.pth in that directory to remove the corresponding egg entry. The mxODBC Connect Server must listen on this port. You can use SSL to encrypt all communication and authenticate your clients via certificate verification (see the documentation of the server side SSL configuration "Client Certificate Access Rules" on page 24). String with the client's PEM-encoded private key. String with the client's PEM-encoded certificate. The server installer provides a default, self-signed certificate-key pair client.pkeyand client.certwhich can be used by clients. This section defines configuration details needed for integrating mxODBC Connect Client with third party software. Defines which SSL module mxODBC Connect Client should try to import and use on the client side. Possible values are sslor pyOpenSSL. When not set, mxODBC Connect Client will first try to import the pyOpenSSL module and fallback to the Python standard library ssl module (available in Python 2.6 and later), if this doesn't work. mxODBC Connect Client comes with gevent support. If you are using the gevent library, you can set this setting to 1 in order to enable mxODBC Connect Client's gevent support. It will then integrate with the gevent library and use the asynchronous versions of the socket and ssl modules instead of the regular ones. The [Integration] section was added in version 2.0. The mxODBC Connect Client session constructor ServerSessiontakes a parameter config_datawhich can be used to configure the session without requiring installation of a client-side configuration INI file or to override certain settings from the configuration file with new values. If both config_fileand the config_datadictionary are given on the ServerSessionconstructor, the values from config_dataare merged into the values read from the configuration file or override them. The client in the above example will connect to a Windows based mxODBC Connect Server which listens on 192.168.1.100:6632 for plain text (unencrypted) connections.. The .open()method returns an efficient proxy object which implements the same API as mxODBC's subpackages have. The subpackage you are proxying requests to depends on the client configuration setting [Session] remote_module. It defaults to mx.ODBC.Managerwhich is an alias to the server platform's default ODBC manager and should be a reasonable choice in most cases. Please see the mxODBC documentation for details on how the mx.ODBC.Manageralias is chosen. After this initial setup has been done, you can use the ODBC object as if you were running the application on the mxODBC Connect Server machine, e.g. The ServerSessionobject will also close itself at garbage collection time (ie. when all references to it have been removed from Python namespaces), however, it is not always clear when this happens due to the way Python's garbage collection works, so closing the session explicitly is the preferred way to close the session. Please note that if you store the ServerSessionobject as module global, the object will likely only be garbage collected at Python interpreter shutdown time, i.e. when exiting the application. However, there is a slight delay compared to the explicit approach, since the server only checks connections in regular intervals (usually every 2 seconds, see [Activity] check_intervalin the server configuration file documentation on page 26). test.pyc currently only supports anonymous server logins. This may change in future versions of the mxODBC Connect Client. Tested with gevent 0.13.4 and greenlet 0.3.1.
mxODBC Connect Client can optionally integrate with the greenlets via the Python package gevent and using the libevent polling library. mxODBC Connect Client will then use gevent APIs for communicating with the server side, allowing other greenlets to run asynchronously while the client waits for the server response. For best compatibility, please import the gevent package before importing the mxODBC Connect Client into your Python application. The client does not require enabling the gevent monkey patching features, nor does it enable these itself. We have tested mxODBC Connect Client in a gevent monkey-patched environment, but recommend using gevent APIs directly rather than through the monkey patched setup. If you want to use encryption, you will also need the Python standard library module ssl, which is available in Python 2.6 and later, orour eGenix pyOpenSSL Distribution package. However, this is not essential for working with mxODBC Connect. Since the mxODBC Connect Server always runs on Python 2.7, the decimal and datetime modules are always available on the server side. This allows clients still running on Python 2.5 or 2.6 to communicate with the database using types from these packages. The Python datetime moduleand decimal modulecan be fully utilized with Python 2.5 and 2.6 clients. mxODBC Connect Client 2.0 supports the geventmodule for running tasks asynchronously without using threads or by combining asynchronous execution with threads. This allows for better scaling of Python client side applications, especially on multi-core machines. Please see section 5.3gevent Support for details. This operation will only succeed for basic pickleable Python types (Unicode, string, numbers, etc.) as well as eGenix mxDateTime instances, since the server only provides support for these types. Unfortunately and unlike many other basic Python types, Python 2.7 memoryviewscannot be pickled. As a result, they cannot be used as parameters to cursor.execute*()methods and are not available for passing data to the server database. mxODBC Connect Client manages a cache of objects in order to increase performance and provide more reliability. Due to this cache, garbage collection of e.g. database connection or cursor objects may not directly result in the objects to get implicitly closed. This may result in a situation where e.g. connections are kept open on the server side longer than necessary and even result in the application hitting a database connection license limit on the server more often than necessary. You can easily prevent this, by explicitly closing cursor and connection objects after use. For the most common case of using error handlers, ignoring database warnings, you can use the .warningformatconnection/cursor attribute which allows choosing from different mechanisms to e.g. ignore warnings on the server side. Please see the Database Warningsection in the mxODBC documentation for more details. For more recent changes, please visit the product page on the eGenix.com website. ● Added support for returning SQL Server TIME columns as time value instead of as string. ● Added a work-around to prevent truncation warnings with the SQL Server ODBC driver when using .executemany(..., direct=1). Thanks for Michael Bayer. ● Upgraded the mxODBC used in the server to version mxODBC 3.2.1. ● Added egenix-mx-base dependency to mxODBC Connect egg files. ● Added hint on how to work with REF CURSORS in Oracle stored procedures. Thanks to Etienne Desgagné. ● mxODBC Connect Server is now also available as native 64-bit build for Windows 2008R2, Vista and 7 x64. ● All mxODBC Connect Server executables are now signed on Windows to reduce the number of UAC dialogs during installation and use. ● The mxODBC Connect tray app was rewritten in C to reduce the memory footprint. ● The mxODBC Connect Server tray application was updated to work on Windows 7 as well. ● mxODBC Connect now supports Python 2.7 both on the client and server side. ● mxODBC Connect Server now supports unixODBC 2.3 or later on Unix platforms. unixODBC 2.2 is no longer supported on 64-bit systems. ● mxODBC Connect Server now uses mxODBC 3.2 internally and makes its API available in the mxODBC Connect Client. This is a major step forward from the mxODBC 3.0 version used in mxODBC Connect Server 1.0. ● mxODBC Connect Server now features all the ODBC driver compatibility enhancements provided by mxODBC 3.2, including better support for MS SQL Server Native Client, Oracle Instant Client, Sybase ASE, IBM DB2, Teradata and Netezza. ● See the included mxODBC 3.2 documentation for more details..
● mxODBC Connect Client now integrates directly with gevent, allowing client applications to run asynchronous tasks while performing remote database queries. ● mxODBC Connect Client also works with a monkey-patched gevent environment. ● mxODBC Connect now uses the official IANA registered port 6632 (mxodbc-connect) for both plain text and SSL-encrypted communication. ● Added STARTTLS support to be able to use a single port for both unencrypted and SSL-encrypted communication. ● mxODBC Connect Client no longer requires a client certificate and key for SSL connections. ● mxODBC Connect Client now allows selecting the used SSL module from two available options: Python standard lib ssl module and pyOpenSSL. ● Upgraded to pyOpenSSL 0.13.0-1.0.0j on the server side. ● mxODBC Connect Server will now use SHA1 digests for client certificate checks instead of MD5 to improve security. ● mxODBC Connect Client can now additionally read client certificate and private key from the config_data dictionary instead of from files only - provided that pyOpenSSL is used (Python's ssl module doesn't support this). ● Client certificate checks are now also supported when using the standard Python ssl module on the client side. ● mxODBC Connect Server will now return ProtocolErrors to the client side and close the connection in case it finds that it cannot decode the client side pickle. ● Fixed a problem with database connections being kept alive in sessions that were not explicitly closed by the client application. 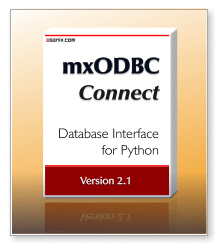 ● mxODBC Connect pure Python prebuilt archives did not always install on non-Linux platforms. ● ServerSession.close() will no longer cause error messages at Python exit time, if the close action cannot be communicated to the server. ● mxODBC Connect Client will now raise a mx.ODBCConnect.Error.ConnectionFailureError in case of server connection failures due to timeouts. ● Fixed a bug in session.open() which caused the module_name parameter not to get used. ● Python 2.3 and 2.4 support was removed from mxODBC Connect Client. ● The start menu entry on Windows now includes a link to the correct ODBC manager to be used with mxODBC Connect Server. This helps finding the right one on Windows x64 platforms which provide two versions. ● mxODBC Connect Client will now directly install into the correct directories on Linux distributions that use different directories for platform dependent and non-dependent directories (e.g. 64-bit RedHat and 64-bit OpenSUSE), without needing additional options on the install command. ● Added backwards compatibility support for the old-style using_ssl way of configuring server connections. ● Fixed a problem with connections sometimes timing out after 10 seconds of inactivity. ● Connection errors now cause an implicit immediate close of the connection (without having to wait for a timeout). This allows the client to shutdown much faster when exiting the Python client application in the situation of a broken server connection. ● Clarified the INI file format used by mxODBC Connect Server and Client and added an extra section for this to the documentation. ● Added cursor iterator support to mxODBC Connect Client. ● Fixed a bug in print_resultset() due to a missing import in one of the modules. ● mxODBC Connect Client prebuilt archives failed to install on non-Linux platforms. ● mxODBC Connect Client's ServerSession.close() will no longer cause error messages at Python exit time, if the close event cannot be communicated to the server. This software is covered by the eGenix.com Commercial License Agreement, which is included in the following section 11.1. The text of the license is also included as file "LICENSE" in the package's main directory. By downloading, copying, installing or otherwise using the software, you agree to be bound by the terms and conditions of the following eGenix.com Commercial License Agreementand the terms and conditions of the third-party licenses listed in section 11.2Third-Party Licenses. ● Microsoft Visual C++ 9.0Runtime DLLs - These may only be used with the mxODBC Connect Server installation. For copyrights, notices and license texts please see the eGenix.com Third-Party Licenses 2.0 document which is included in the product documentation directory and also available from the eGenix.com web-site. For the list of available platforms, please see the eGenix.com website. PEM format is a special text file format, which can easily be edited using a text editor.